As a voestalpine Digital Native right from the start, Stephanie Bauer is responsible for the Corporate Online & Social Media Strategy in her role as Managing Editor for topic management in the newsroom. In Germany and Austria, it is the norm to complete a 3 to 4 year vocational training. But there is not a comparable training system in all of the countries where voestalpine is present. Since the need for well-trained skilled workers remains at a constantly high level, the Metal Forming Division not only exports products, it also exports the “apprenticeship” concept—and develops ideas on how to interest young people in these apprenticeships. There is a certain type of “US apprentice,” but this apprentice is usually somewhat older than the average apprentice that we are familiar with. But young talent is important for all Group sites. In many countries, voestalpine companies are adapting the Austrian system, thus not only winning over motivated young talent, but also the recognition of community and country politicians. A good name alone is no guarantee for a continuous stream of new young skilled workers. Also because voestalpine is not as well-known everywhere else as it is in Austria. This fact has been recognized by HR around the world. But it is not only in Great Britain or Brazil that ideas are needed to make young people aware of the attractiveness of such training. Even in Austria it is important to collect fresh ideas and come up with new ways to attract good apprentices. Group-wide, 1,377 apprentices were in training in the past business year. voestalpine invests EUR 70,000 to train each apprentice in the dual system of vocational education and academic studies. That is the Group’s key provision for the future. In 2012, voestalpine Meincol S. A. started up an internal apprenticeship program that is offered in cooperation with the National Service of Industry. The third group of 14 apprentices is now being trained. To attract skilled workers, the Brazilian voestalpine subsidiary uses the power of a role model. Especially young family members should be given first-hand information and be encouraged to apply for an apprenticeship at Meincol. Impressive: The first apprentice training class at voestalpine Meincol (BRA). In addition to regular school, the apprentices attend afternoon classes at Meincol. A handicap: National law forbids minors to be trained in the factory—they receive alternative practical training. "We are pleased to be able, especially in a difficult phase for the Brazilian economy, to hire 30% of our graduate apprentices." 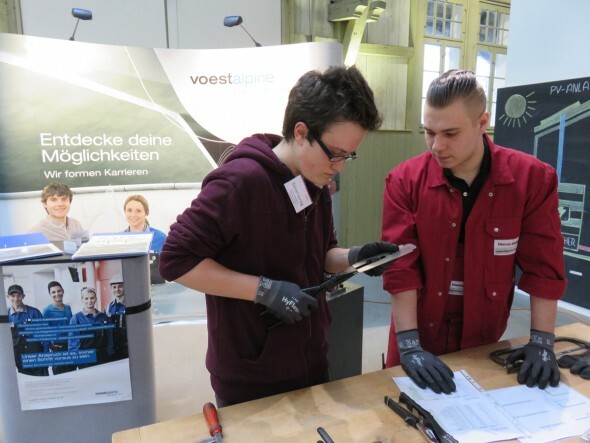 In the limelight: Apprentices at Automotive Components Schwäbisch Gmünd convince young people at training fairs of the value of an apprenticeship at voestalpine. The key: Here, the young visitors meet similarly aged apprentices, who can tell them firsthand what it is like and convince them to start an apprenticeship at voestalpine. "We enjoy supporting the young people as they start their career." Sister company voestalpine Automotive Components Bunschoten also counts on children’s and young people’s enthusiasm for experience when promoting young talent. And therefore, since 2016, it has been cooperating with JINC, a nonprofit organization in this business sector, whose goal is to enable students to obtain specific, practical experience in various fields of work (e.g., a “trial apprenticeship”). 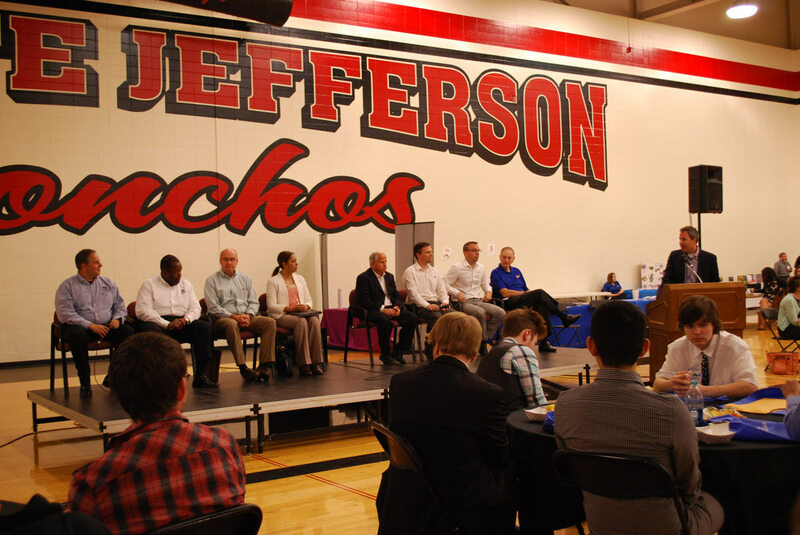 JINC allows students to come into contact with business early on. They practice applying their knowledge, get to know various careers, and discover together with a trainer what job matches their capabilities and skills. voestalpine Metsec plc has been training apprentices for many years in an exemplary manner. The roll forming specialist in Oldbury near Birmingham relies on a strict, in-house training program. In Great Britain that is not usual; most companies rely on external providers or colleges to train their apprentices. The apprentices spend the first year of the three-year program in the in-house training center, where they learn practical metalworking skills. The next two years, they work in all departments throughout the company to gain an overview of operations. voestalpine Metsec has declared a goal of recruiting 20% of its workers from apprentices they have trained themselves. Safety, Environmental, and Training Manager Steve Giles, who was conferred the Apprentice Ambassador 2016 award, emphasizes: “Our program allows apprentices to understand how the company works as a whole. They feel they are a part of the team from the very first day.” In 2016, voestalpine Metsec welcomed their 100th apprentice. 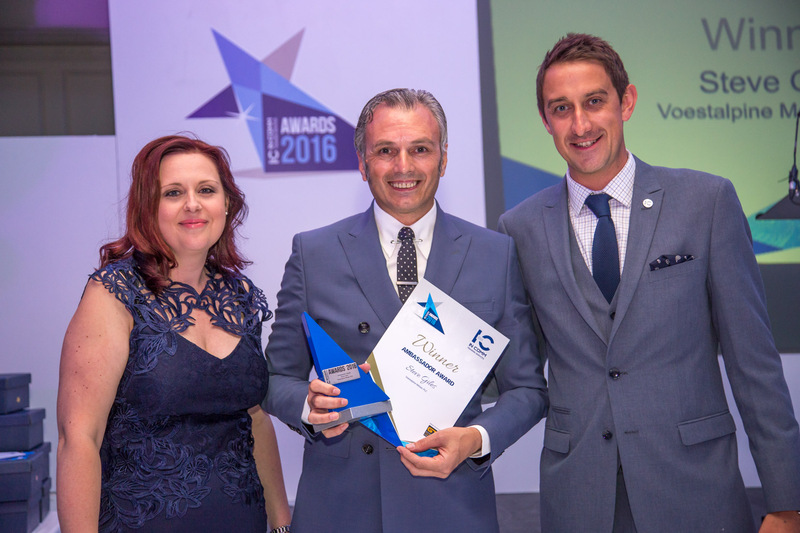 Taking over the award: Steve Giles (middle) is 2016 Apprentice Ambassador of the year. The voestalpine companies in the USA also have to take into account that there is no comparable, local dual training system. So voestalpine Roll Forming Corporation (RFC) in Shelbyville, Kentucky, for example, relies on its own in-house trainee program. Over a four-year period, young skilled workers complete 576 hours of school learning and many thousands of hours of practical training. 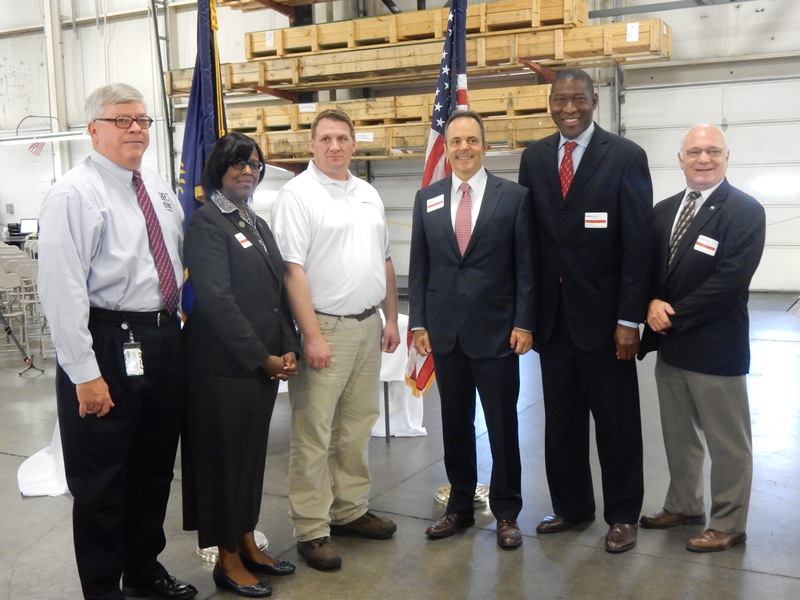 In September, the governor of Kentucky honored RFC for this program, from which numerous toolmaker apprentices have graduated. For the governor, the apprenticeship at RFC is a role model for other companies in Kentucky. Honored: Kentucky Governor Matt Bevin (third from right) honored voestalpine RFC for its training program. 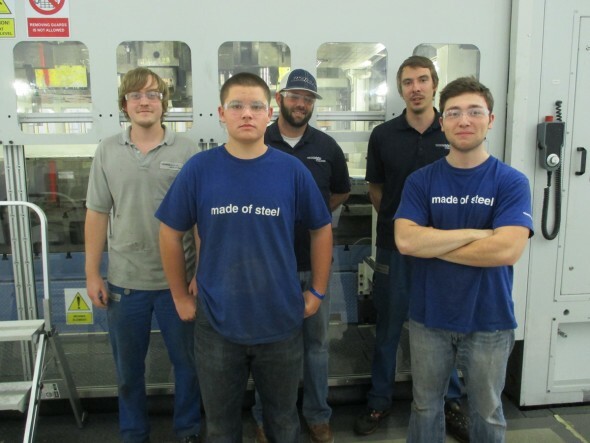 Hard as steel: graduates of the model apprenticeship at voestalpine Automotive Components Cartersville. voestalpine Rotec Inc. in Lafayette, Indiana, is active in regional networks to promote young talent. With the help of programs like Youth Summit and Manufacturing Week in greater Lafayette, companies can present themselves to high school students. voestalpine Rotec took advantage of this opportunity to provide information on job and internship opportunities. Informative: first-hand information on job and internship opportunities in Lafayette (USA).